ModDance LLC reserves the right to withdraw any class due to lack of enrollment. Once a student is registered, he/she is responsible for all tuition charges / fees regardless of attendance. All students under the age of 18 must have a parent/guardian signatures on the registration form. Only by contacting the office with a written letter will the student be removed from the class roster. Failure to contact the office within 30 days of registering, will result in the student being billed for the entire year (including costume and recital fees). Informing the teacher is NOT acceptable notice. 1--Students should be dropped off no earlier than 15 minutes prior to their scheduled class and should be picked up within 15 minutes of the end of class. If a student is tardy, it’s at the instructor’s discretion whether to allow the student to join the class already in progress. This is for the student’s safety and injury prevention. 2--No relatives or friends of students are permitted at the studio while a student is in class without parental supervision. 3--Trial classes may be requested for students interested in new techniques, however, trial classes DO NOT hold a space in the class. 4--Enrollment is on a first come, first served basis. 5--All inquiries regarding billing, fees and payments should be made to the studio secretary. Please do not approach the teacher regarding these matters. Tuition RATES: Tuition can be broken into 10 equal monthly payments. Tuition is not affected by school closings due to holidays and inclement weather conditions. Pay Schedule: Payment is due the first week of every month. A late fee of $15/month will be added to all payments not received by the 15th of the month. Stuudents not up to date with payment will not be allowed in class! additional lessons must be paid up front! Recital fee package 2018: * Due with your child's January tuition. 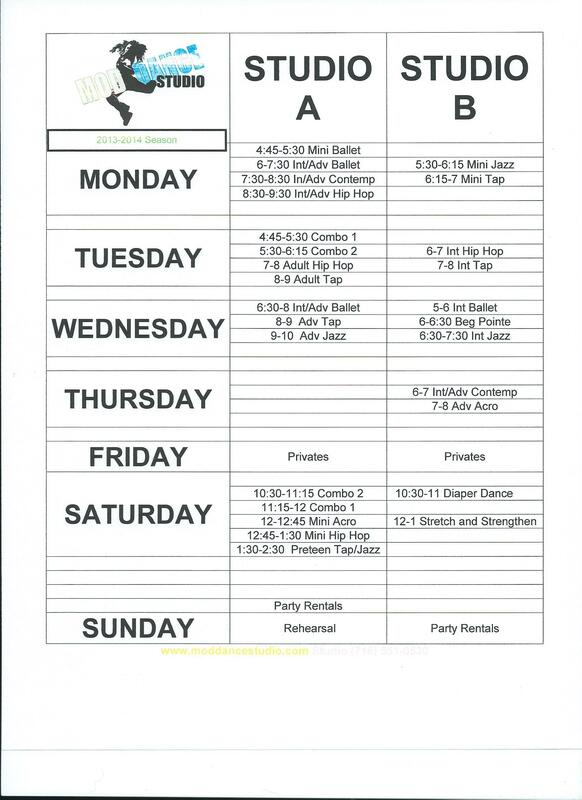 Costume Fees: All costume fees are due with or before November tuition.